England were Sunday looking forward to their first World Cup semi-final since 1990 as host nation Russia came to terms with the end of their extraordinary run following defeat on penalties to Croatia. 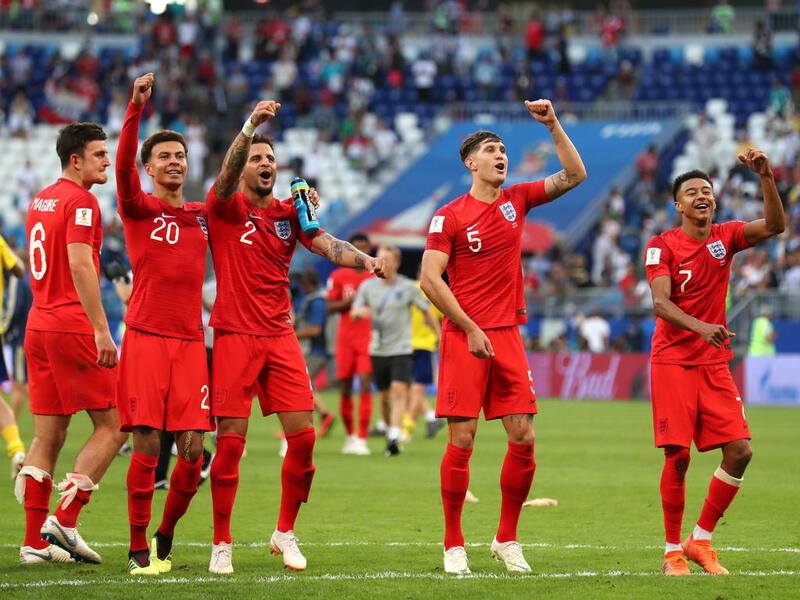 Gareth Southgate's young team swept Sweden aside 2-0 on Saturday, sparking mass celebrations in England where at least 20 million people watched the match on TV. Leicester defender Harry Maguire headed England ahead in the first half in Samara and Tottenham's Dele Alli added a second just before the hour as Southgate's team enjoyed the lion's share of possession. England have won the World Cup just once, when they hosted it in 1966, but the public and pundits are starting to dream. "England's players have guaranteed they will return from the World Cup as heroes. Now they can dream of a grander ambition. Can they come home as legends?" asked former England defender Jamie Carragher in a column for the Sunday Telegraph. Russia's fairytale run came to a halt as they were beaten on penalties by Croatia after 120 gruelling minutes of football. The Russians came into their own tournament as the lowest-ranked nation but, just as they did in eliminating Spain in the previous round, refused to die despite enjoying just 36 percent of possession against a superior Croatian team. Croatia, led superbly by Luka Modric, thought they had won the match when Domagoj Vida rose to nod in a corner in the first period of extra time but Mario Fernandes headed home from a free-kick to pull Russia level at 2-2. But Russia failed to convert two of their spot-kicks, leaving Ivan Rakitic with match point and the Barcelona man kept his head to seal a 4-3 win. Croatia defender Vida faced possible disciplinary sanctions from FIFA after posting a clip dedicating the victory to Ukraine. Vida, who used to play for Ukrainian club Dynamo Kiev, shouted "Glory to Ukraine!" in a video posted by former Croatia international Ognjen Vukojevic shortly after the match. FIFA said it was investigating. Away from Russia, the Spanish football federation said Fernando Hierro, who stood in as Spain coach when Julen Lopetegui was sacked on the eve of the World Cup, would not continue in the role.